Tornado Toll Mounts in Tennesee A cleanup is under way in the suburbs of Nashville, where at least 12 people died Friday in a new round of tornadoes. 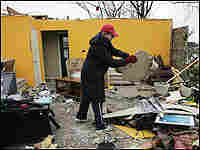 More than 160 houses were either damaged or destroyed. Funerals were held elsewhere in the state for victims of earlier storms that left 24 dead. A cleanup is under way in the suburbs of Nashville, where at least 12 people died Friday in a new round of tornadoes. More than 160 houses were either damaged or destroyed. Funerals were held elsewhere in the state for victims of earlier storms that left 24 dead. 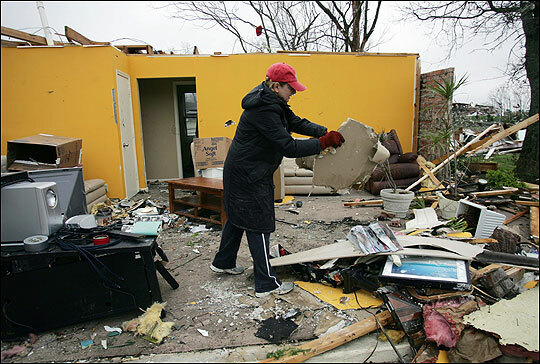 Karen Jensen clears storm debris at her home in Gallatin, Tenn. This is ALL THINGS CONSIDERED. From NPR News, I'm Debbie Elliott. We'll have reports this hour on the stormy political week in Washington, but first we go to the state of Tennessee. This afternoon, residents of the Nashville area are cleaning up after another deadly wave of tornadoes. Yesterdays storms claimed a dozen lives a week after tornadoes killed 24 people elsewhere in the state. NPR's Audie Cornish has our report. Preston Harman(sp) was among the handful of people ducking caution tape and skipping over glass in the Volunteer State Community College parking lot. He's come to find the car his math instructor wife left behind Friday when a tornado slammed the campus. Mr. PRESTON HARMAN (Tornado Survivor): I would just assume it would be totaled. Who knows what it's gonna cost to repair this thing. CORNISH: But many other cars were totaled, or like junior student Tabitha Whitby's(ph), totally missing from the lot. Whitby rode out the tornado at the school's shelter. Ms. TABITHA WHITBY (Student, Volunteer State Community College): You know, the day before they were talking about this stuff and we must have just overlooked it because it's nothing major and then when it really does hit it's like, maybe we should have listened that time. Mr. RANDY HARRIS (Tennessee Management Agency): As much as you warn people, people are optimistic that maybe they won't be the ones that get hit with it. CORNISH: And there's no way to know who will get hit with it. Weather officials can issue county-wide warnings but can't say when a tornado will actually form and touch down. This is particularly true for the South, says Jerry Orchanian, the warning coordination meteorologist at the National Weather Service in Nashville. Mr. JERRY ORCHANIAN (Meteorologist, National Weather Service): You can have a tornado embedded in a rain column and people won't even see it. Out in the plain states, where the terrain is flatter, you can see these tornados ten, fifteen miles away before they come at you, so it's especially dangerous in the South and especially if they hit at night. CORNISH: All of this comes as FEMA officials were visiting the state to assess damage from last weekend's tornados. Audie Cornish, NPR News, Nashville.